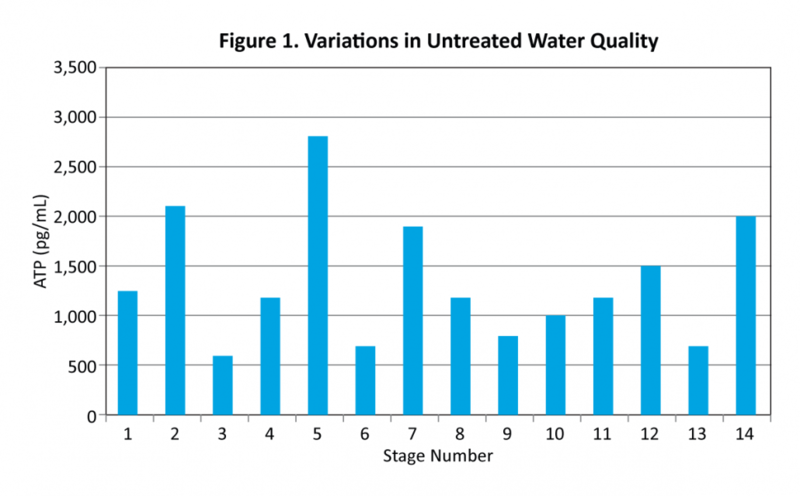 Untreated water quality can vary widely during a single frac job, as shown in the example of bacteria levels (Figure 1). Real-time monitoring of water quality is critical to effective water treatment and blending of consistent frac fluid formulations. Hydrozonix monitors water quality in real time, employing multiple test methods using hand-held and inline probes, and actual field testing with portable analytical devices. Armed with this real-time data, adjustments can be made on the fly. The table below summarizes the benefits of real-time water quality monitoring in protecting frac fluid quality, increasing recycle rates and adjusting quickly to problems. Treatment verification Changes in water quality require real-time knowledge to protect frac quality. Working tank monitoring is critical. Recycle rate optimization Testing in real time allows for balancing the maximization of produced water use without exposing frac fluids to chemical compatibility issues.